Notice that this JoFit Ladies Tapered Mock Sleeveless golf shirt has a different cut to highlight your curves. It is in the slimming color of Black and features a shaped waist, has a bright Grass Green center front zipper that lets you adjust the neckline and Harlequin print on arm holes. Also check out this JoFit Ladies & Plus Size Cut Away Sleeveless golf/tennis shirt in full Harlequin print. This golf/tennis shirt has the traditional shirt style with a twist. The sleeves have an opening enough to show off your toned shoulders. It also enables you to a full range of motion. You can now look and play better with this golf shirt on. This JoFit Ladies Oracle Short Sleeve Golf shirt offers an invigorating minimalist style. It has clean collar lines that extend through a center front zipper. Its Harlequin print and colors White and Grass Green definitely suits the rest of the Grass Green golf bottoms of this JoFit Melon Ball collection. These golf tops with Harlequin prints will automatically be a stunner when paired with JoFit Ladies & Plus Size Zippy Pull-On golf skort. It is a pull-on skorts with a fashionable side zip detail which shows contrasting fabric of Grass Green and Blue. It also has undershorts, back patch pockets and made of moisture wicking Jo-Dry Jersey fabrication. Match the above-mentioned beautiful harlequin-printed JoFit Melon Ball golf shirts with these Grass Green-colored golf bottoms. For sure, that would be an added glam on the sassy golfer’s ootd. 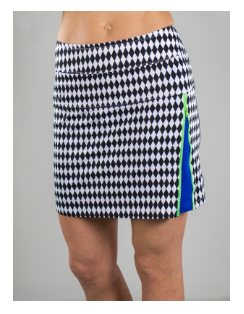 Here are the trendy golf skorts you can choose from. The first one is a JoFit Ladies & Plus Size Jacquard Mina Pull-On Golf Skort. You’ll love its looks and performance. This flattering functional piece is made of light and comfy Jo Jacquard fabric. This has deep hip pockets that stays flat and has built-in undershorts. While the second one is an 18” JoFit Ladies Belted Golf skort. It is made from the signature JoFit’s 2-way stretch woven fabric with a classic fit. It also has belt loops for tucked-in option, back patch pockets perfect for score cards, front pockets for utility. Both golf skorts are designed to prevent muffin top, flatten the abdomen and create a lifted bottom and overall narrowed appearance. You may choose to wear either 7” JoFit Ladies Belted Golf short or this 28” JoFit Ladies Belted Cropped Golf pants. They have the same quality features of the JoFit Ladies Belted Golf skort. Browse the rest of the lovely JoFit golf/tennis pieces in this Melon Ball collection here and visit the physical store at Lori’s Golf Shoppe in Calabash, NC. Not confident in your outfits? Are you hesitant that you might be doing a mix and match with your golf wears the wrong way? Worry no more. We’ll be giving you some help, Here’s five possible golf outfits that you can wear in the JoFit Tahiti golf collection. The first JoFit Tahiti golf outfit is a JoFIt Ladies white long sleevegolf shirt and a citron-colored golf shorts. This outfit gives an impression of a sporty, outgoing and confident lady golfer. The colors used (white and citron) also give a fresh and clean look, ready to hit the golf course. The golf shirt is a JoFit Ladies &Plus Size Long Sleeve UV Golf/Tennis shirt that protects your skin from the sun’s harmful rays. You may wear this as is or as a layering piece in your golf oufit. For its bottom, the citron-colored JoFIt Ladies Belted Golf Short is good worn with tops tucked in or tucked out. It has a flat front, straight leg, belt loops, back patch pockets for score card and front pockets for utility. As seen in the picture, it is paired with a blue JoBelt and head covers. 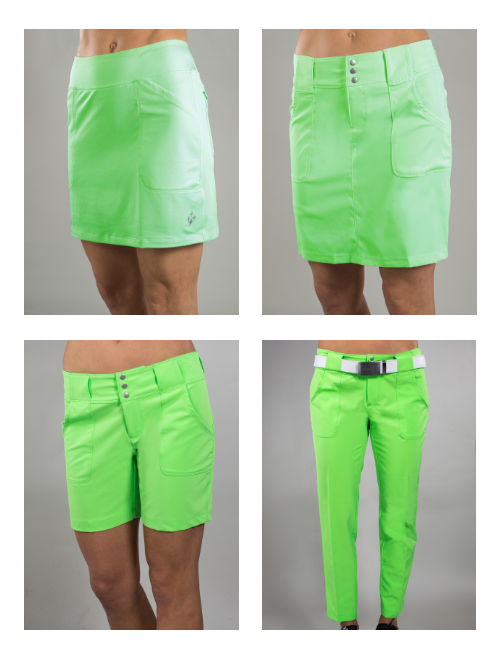 The second JoFit Tahiti golf outfit is a matching JoFit shirt and skort in Citron and grape. The JoFit Ladies &Plus Size ¾ Sleeve Raglan Pull over golf shirt has an asymmetrically placed zipper, has signature shaped waist and scoop bottom. While the JoFIt Ladies& Plus Size Jo Slimmer Golf skort, true to its name, gives a slimmer and slicker appearance on you as you hit the links. Look better when you match this JoFit shirt and skortwith a citron-colored visor. While the third JoFit Tahiti golf outfit is a combination of a JoFit Ladies &Plus Size Jo Tech Short Sleeve Golf shirt and Mina Golf Skort. This JoFit Tahiti outfit is bold enough to mix and match citron and grape colors in plain and plaid golf items. Grape-colored Jo Tech Short Sleeve Golf shirt polo has a feminine cross over citron V-neckline while the JoFIt Ladies &Plus Size Mina Golf Skort is a grape windowpane printed golf skort that has a narrowed appearance, deep hip pockets which stay flat and is designed to smoothen and flatten the abdomen. The fifth JoFit Tahiti golf outfit is a combination of JoFit Ladies &Plus Size Cut Away Johnny Sleeveless Collar golf shirt and the JoFit Ladies & Plus Size Jo Slimmer Golf Pants. Pants (33 ½ “ Jo Slimmer Golf Pants) and sleeveless shirt (Cut Away Johnny Sleeveless Collar golf shirt) perfectly match each other because they highlight a particular part of a lady golfer’s body, which is your shoulders and arms. If you love to flaunt out those sculpted arms you’ve worked hard for or if you are just more comfortable to swing your arms in sleeveless golf shirts, here’s one for you. The Cut Away Johnny Sleeveless Collar golf shirt, just like JoFit Ladies &Plus Size Tipped Short Sleeve Golf shirt, is in Windowpane print with a twist of citron on the V-neckline. While its bottom belongs to the ready-to-go and fit-perfect Jo Slimmer golf items featured in 2015 JoFit Spring collection. These suggestedJoFit golf outfits mentioned above are for ladies and plus size and may be re-mix and match according to your taste. Check out the JoFit Sizing Charts here. Find more of the JoFit Tahiti golf items you may want to mix and match at www.lorisgolfshoppe.com and Lori’s Golf Shoppe at Calabash, NC. Aside from the great golf collections, JoFit also offers lifestyle pieces to be worn off the golf course. These three touring tees are soft, comfy, fashionable and made of silken rayon spandex. Wear this and you’re ready to hit the 19th hole. The first one is a JoFit Ladies & Plus Size Touring Tees – Lifestyle in White. It gives a fresh look and feel as you wear this rounded V-neck Touring Tees. Since it also has a sleeve blending in Blue Depth and Jo Pink, you may pair this with golf skort, short or pants in either Blue Depth or Jo Pink. The second one is a JoFit Ladies & Plus Size Time Off Lifestyle Tees – Bali. Blue Depth and White are the colours used in this shirt and complements other golf items in JoFit Bali collection. This Lifestyle Tees is a high neck and raglan sleeve that gives emphasis on narrowing and elongating the body size through the Blue Depth color on it. While the third is a JoFit Ladies & Plus Size Lifestyle Touring Tees from the JoFit Fiji collection. It is a JoPink-colored touring tees that has a rounded V-neck and sleeve blending of Black and White. It gives a vibrant feminine look that perfectly matches the golf items featured in JoFit Fiji collection in Black and White. Be sure to check out the JoFit Sizing Chart here. These Touring tees came from different JoFit collections you may check at www.lorisgolfshoppe.com or visit personally at Lori’s Golf Shoppe at Calabash, NC. What we love about JoFit golf and tennis wear is that it has a wide variety of styles in one collection. Black (Plain and plaid), White, Eyelet and JoPink. You name it and this JoFit Fiji collection has it all. Let’s start with the black golf shirts. It is important to have a basic black golf shirt because it gives a slimmer and sexier look thus boosting confidence in playing the game and in socializing with friends after the round. This JoFit Ladies & Plus Size Jacquard Lifestyle Sleeveless golf shirt is perfect for ladies who are confident enough to show off their sculpted arms. But if you opt for a golf shirt with sleeves, here’s the JoFit Ladies & Plus Size Jacquard Performance Short Sleeve golf shirt for you. Both have center front zippers to control the depth of the neckline and are cut in at the waist to slim, shape and lengthen your body figure. The JoFit Fiji Black collection also has gorgeous jackets and long sleeve items that vary in cut and style but will all definitely keep you sun-protected and golf course fashion celebrity ready. First, there’s this JoFit Ladies Thumbs Up Golf/Tennis Jackets. It has a contrast white zip that can be pulled from bottom to top and a thumb-hole option to keep the jacket in place when you’re wearing it. Truly, it is a fashion thumbs up. Second, there is this JoFit Ladies & Plus Size Golf/Tennis Jet Set Jacket. This jacket has a silver asymmetrical zipper and a flattering bottom that lets you wear it on and off the golf course. Third is another stylish layering piece, the JoFit Ladies & Plus Size Golf/Tennis Jumper Jacket. It is a chic pullover jacket that also has an asymmetrical collar, side zip opening and thumb hole sleeves. The fourth item is a JoFit Ladies & Plus Size Challet Lifestyle Cardigan. It is made of buttery soft French terry and has a comfy flowy silhouette. Perfectly pair this is with the JoFit Lifestyle bottoms or your favorite jeans in your closet. And the fifth one is the JoFit Ladies & Plus Size Long Sleeve Mock Neck Golf Shirt. This layering piece has a mock neck with an adjustable center front zip. It is also available in Black/White. Another golf items with contract colors of black and white is the JoFit Ladies Tech & Plus Size Golf/Tennis Jacket. The JoFit Ladies Tech & Plus Size Golf/Tennis Jacket is water resistant and has bonded fleece lining, pockets with zip closures, adjustable Velcro strap cuffs, reflective taping at the sleeves and a 2-way zipper. This Tech & Plus Size Golf/Tennis jacket creates an hourglass figure to complement a woman’s shapes and curves. There are a lot of JoFit Fiji collection bottoms, too. For the black golf skorts, you may want to wear a JoFit Ladies & Plus Size Tina Golf Skort and JoFit Ladies Signature Golf Skorts. Both are made from quality JoTech pique fabric that gives comfort, functionality and style to the one wearing it. For the black golf shorts, there are two items included in the JoFit Fiji collection. One is the 12” midrise inseam JoFit Ladies Bermuda Golf short which has a contoured 3-inch waistband, snaps and a fly opening. While the 7” JoFit Belted Golf short has both reliable front and rear pockets for added functionality. Glam up this JoFit short when you wear a matching JoBelt to it. For the golf pants, the 33” inseam JoFit Ladies & Plus Size Packable Lifestyle golf pants, 26” JoFit Ladies Belted Cropped Pants and the 29” JoFit Ladies & Plus Size Lounge inseam Lifestyle Pants are included. These three vary in length but all are made to cover unnecessary lumps and bumps thus adding confidence and performance on and off the golf course. The JoFit Slimmer golf bottoms are also included in this Fiji collection. It has JoFit Ladies & Plus Size Jo Slimmer Golf Pants, Pedal Pushers and Skort. True to its name, the items are specifically made to give a slimmer appearance of your legs, move with comfort and allow better performance during golf tournaments or for whichever occasion you wish to wear these JoFit Slimmer items. These JoFit Fiji Slimmer bottoms items are available in Black and White. Black plaid print is a chic print that should be included on you golf wear collection. It will perfectly match a golf shirt of any color that you have. There are three items that have this black plaid print (also available in black and white) – JoFit Ladies Bermuda Golf short, JoFit Ladies Belted Golf short and the JoFit Ladies Belted Cropped Golf Pants. The 12” mid-rise JoFit Ladies Bermuda golf short has a contoured 3-inch waistband with easy to use snaps, double needle top stitching and a fly opening. It also has on-seam zipped pockets that provides secured space for valuables. While the 7” JoFit Ladies Belted Golf Short and 28” Cropped golf pants are designed in JoFit’s signature 4-way stretch woven fabric in a classic fit, tailored in a sleek silhouette with a flat front and straight leg. These three items (Bermuda Golf short, Belted golf short and Cropped Golf pant) in black plaid print are all designed to keep shape, avoiding muffin top and have a moisture-wicking nylon and spandex blends that move with you. They have pockets for scorecards and perfectly pairs with a Jo-Belt of any color. The JoFit Fiji collection golf items are also available in White. White shirts are a must in every wardrobe, a fashion staple, because you can easily match and accessorize it with anything. Also, white golf shirts give a fresh and comfortable feeling to the one wearing it even when the scorching heat of the sun meets the on-course heat of the game. There are 4 pieces of JoFit golf shirts in this Fiji collection. One is a JoFit Ladies & Plus Size Jacquard Jo Tech Golf shirt. It is has feminine cross over V-neckline that keeps you feeling fresh as you play your game. It also has a shaped waist to flatter your curves, a scoop bottom hem and extra length. It is also available in Black/White. The other one is the JoFit Ladies & Plus Size Jacquard Performance Polo Golf shirt. Both are made of 88% Poly 12%Spandex Jo Jacquard. The third is a JoFit Ladies & Plus Size Sleeveless Time Zone Tunic Lifestyle shirt. Also a sleeveless golf shirt, the fourth one is a JoFit Ladies & Plus Size Jacquard Sleeveless golf shirt. There are also stylish layering pieces in the JoFit Fiji white collection. The white pieces of JoFit Ladies Thumbs Up Tennis/Golf Jacket, JoFit Ladies & Plus Size Jumper Golf/Tennis Jacket and the JoFit Ladies & Plus Size Long Sleeve Mock Golf/Tennis Shirts are some of the items already mentioned above because they are also available in Black pieces too. The other long sleeve shirts include the JoFit Ladies & Plus Size Long Sleeve UV Golf/Tennis Tops. You may want to wear it as a layering piece or by itself but for sure, it will protect your skin from harmful UV rays while radiating good vibes to all. For the bottom, the JoFit Fiji white collection has a JoFit Ladies & Plus Size Tina Golf Skort, JoFit Ladies Signature Golf Skorts, 7” JoFit Ladies Belted Bermuda Golf short, JoFit Ladies & Plus Size Live-in Lifestyle pants. The Tina golf skort has a wide contoured waistband that flatters your shape and avoids unnecessary bulges and vented side seams for full range of motion. While the JoFit Ladies & Plus Size Live-in Lifestyle Pants are a mid-rise pant with flat seams and are slimming pants that looks great to wear on and off the golf course. Have this gorgeous JoFit Fiji collection in Eyelet print. It is in eyelet black and white with pink contrast on its linings. Interesting mix of simplicity and elegance. It is available in a sleeveless golf shirt, short sleeve golf shirt and in a JoFit Ladies & Plus Size Swing Golf/Tennis skort. The JoFit Tipped polo is made of moisture-wicking Jo-Dry fabric and gives a comfortable feeling through its center front zipper so you can adjust the neckline according on what you desire. Women of all body types and sizes will surely love the golf shirts (sleeveless or short sleeves) because it has a shaped waist that flatters female curves, a scoop bottom that elongates the legs and extra length that gives more confidence as you swing around. While the JoFit Ladies & Plus Size Swing Golf/Tennis skort with the same print is a free-spirited skort. You will love this because it is designed to smoothen and flatten the abdomen, covers the unnecessary lumps and bumps, thus, creating an overall narrowed appearance. There is also the JoFit Fiji collection in JoPink. Yes, the collection isn’t just about dazzling Black and White items. We have featured before the JoFit items in JoPink here. In addition to those, here are JoFit Ladies & Plus Size Lifestyle Time Off Tee and JoFit Ladies & Plus Size Lifestyle Touring Tee. Both items offer high end fashion, comfort and style. The first item, JoFit Ladies & Plus Size Lifestyle Time Off Tee, is a soft comfy top, high neck and Raglan sleeves in beautiful blend of JoPink, White and Black. While the JoFit Ladies & Plus Size Lifestyle Touring Tee has a rounded V-neck, sleeve blending colors of black, white and JoPink. JoFit Ladies Golf/Tennis JoBelts are the perfect accessories for any golf outfit that you have decided. It has an adjustable web strap and a diamond buckle brushed in metal. In this JoFit Fiji collection, the best JoBelts to avail are colors JoPink, Black and White since these three directly complement the main colors of this collection. However, you may also avail other colors like Raspberry, Coral Glow, Neon Green, Liquid Blue, Dizzy (Purple), Blue Depth (Navy), Citron and Grape. Be guided on JoFit golf wear’s sizing chart. Don’t worry, they have sizes up to XXL. Also check out www.lorisgolfshoppe.com to see JoFit Tennis items included in this Fiji collection. You may also visit Lori’s Golf Shoppe at Calabash, NC.